Individuals with GERD, or gastroesophageal reflux disease, experience discomfort when stomach acid rises upward and enters the esophagus. It may also be referred to as heartburn or acid reflux. Ranging from mildly irritating to painful, the burning feeling associated with GERD is often triggered by certain foods. Other foods, such as carrots, are considered safe to eat. Drinking carrot juice will help you get the nutrients you need -- without triggering a reaction. 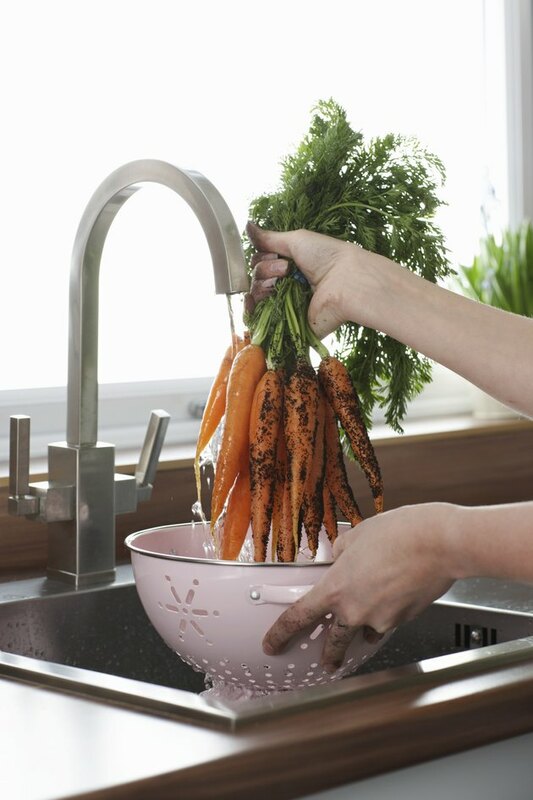 To make carrot juice at home in a juicer, use 2 cups of chopped carrots to produce a 1/2 cup of fresh juice. Carrot juice has 105 calories per serving, and is a good source of potassium; calcium; vitamin C; B vitamins, including folate; and vitamins A and E.
Carrot juice contains natural alkaline components, which help to neutralize excess stomach acid that causes heartburn symptoms. While carrot juice may not provide full or instantaneous relief for GERD symptoms, it is a safe and nutritious beverage for those on a GERD diet. Jill Sklar and Annabel Cohen, authors of “Eating for Acid Reflux,” recommend apple, cucumber and other low-acid juices from fruits or vegetables to soothe the symptoms of GERD. Herbal teas that do not contain caffeine can also provide some relief. Over-the-counter drugs, such as antacids and H2 blockers, work to neutralize or reduce stomach acid production. Foods to avoid include citrus fruits and juices, spicy food, high-fat foods, including full-fat dairy products, tomatoes and tomato sauces, chocolate, alcohol, caffeinated drinks and carbonated drinks. Will Drinking Cherry Juice Irritate My GERD?